Our stylishly durable athletic socks are up to your challenge. 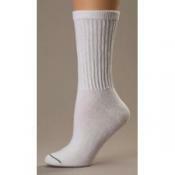 All Burlington® socks are treated with Bioguard® which inhibits the growth of odor causing bacteria on the sock. You demand unsurpassed quality and superior styling. Let Burlington® Socks be your answer.Cotton for comfort and absorbency. Nylon for fit, durability and smooth appearance. Lycra Spandex for better stay-up. Made of 80 % Cotton, 17% Nylon and 3% Lycra Spandex.